Despite gradual improvements in the U.S.'s economy, the job market remains weak. 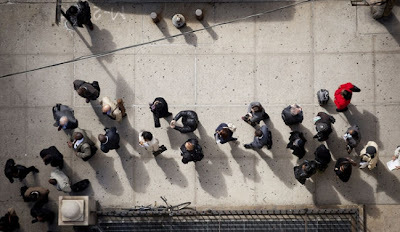 Among the various hindrances hungry job seekers face, the supply and demand ratio of job seekers to positions available is creating an imbalance too disparate for job seekers to reconcile on their own. The 2008 recession caused workers to go from comfortably providing to barely surviving. Although the unemployment rate has gone down since then, the numbers are a reflection of an improving market, rather job seekers have ceased their search or have yet to begin. One statistic makes an eye-opening point: Only 58.6 percent of Americans 16 and older had job in April, according to the Bureau of Labor Statistics. This ratio is actually lower than the 2007-2009 recession's ratio of employment-to-population. The trouble with fixing a problem that has lingered for half a decade is that resolutions proposed on Capitol Hill aren't getting through as bi-partisan tensions run high. Issues that have arisen are often linked back to there being jobs that remain open because of a lack of qualified applicants. The BLS reported on May 7 that there were more than 3.8 million available job positions in the U.S. at end of March. There were 11 million people actively seeking work at that same time. This leads many to the obvious solution that higher education will cure any mismatching issues between job applicants and job requirements. Schooling has, in fact, proven to have a remedying effect. The unemployment rate in April for college graduates was only 3.9 percent whereas the rate for those with less than a high school education was at 11.6 percent. According to Jon Miller, a political scientist at the University of Michigan, there is a great return on investment for educated people. Miller, whose parents were both manual laborers, ensured that his own children would be more educationally advanced than his parents. His son now holds a job as an astrophysicist and his daughter is a neurobiologist with a law degree. As much as education matters, however, job seekers will still be out of luck if the economy is running too slowly to generate jobs. For the Fed, accelerating economic growth through monetary policy is the first priority. But those in Congress feel that faster growth comes second to the issue of trying to decrease the federal budget deficit, which led to the January tax increases and the March sequester, both of which weigh on growth. If the U.S. economy were to produce at full potential, it would generate about $950 billion to annual gross domestic product and accelerate efforts to put people back to work. © Copyright 2019 - Employboard.com™ — All rights reserved.